Since I'm on a roll, I thought I'd keep it up. I posted about food pantries in general, and the attitude that I really hate about whether or not people "deserve" the food a couple days ago. I posted about our Mobile Food Truck yesterday. That happens the third Friday of every month. Today is regular pantry day. That happens on the 2nd and 4th Saturdays of the month. Occasionally, like this weekend, the third Friday and 4th Saturday happen on the same weekend. Usually not. I took two teens over this morning, but I've got a headache (and maybe a bit of a fever, I'm noticing now) and there were LOTS of volunteers, so I took off after going through the pantry as a customer myself. The teens are still there, carrying boxes, helping people select produce, and so on. I'm home enjoying silence. And getting a load of laundry done. And I chopped up apples and started some cranberry applesauce. Updating this to say: I picked them up, and there were 84 families served today. Eighty-four. That is a lot of hungry people. That's my haul, as a family of seven. I wish I had been thinking about posting this, as I might have made some different choices in shopping today. Basically, though, families of four or more get 40 points to shop with. You can see points written on top of some of the containers. Three points are automatically "spent" for bakery, dairy, meat and produce items. Today, that part (for me) included one loaf of sliced bread, a package of English muffins, a blueberry coffeecake, two white onions, 10 eggs, and a carton of sour cream. Because of Thanksgiving, there wasn't meat (there is supposed to be a turkey/chicken/ham distribution on Tuesday). I could have taken more produce. There were potatoes, apples and bell peppers, but I got plenty of those yesterday. There were carrots, which I also have. There were a few heads of cabbage, and I chose to not take one as there just aren't enough for every family coming through. In the regular shopping part, though, you can see I got a few items. A lot of staples there -- diced tomatoes, kidney beans, pasta, pasta sauce, soup (which you can't see in the photo), gravy, condensed milk, chicken broth, a can of yams, and jello. Swiss Miss hot chocolate mix. Big container. My kids are going to be excited. Stuffing mix. We used to see that a lot, but it has been scarce lately. Kraft Spaghetti Classics. This is one of those "comfort foods" things for me. Peanut Butter, even if it is creamy and has a broken lid. Refried beans -- not just any refried beans, but the jalepeño ones we prefer. V8 juice. Thomas especially loves this. Pace Southwest Ranch dip. I'm sure I'll come up with a fun way to use that. Lea & Perrins Marinade in a Bag -- we've had this available a LOT at pantry, for the past few months, and I love it. Sure-Jell -- so at some point, I'll get a bunch of fruit that needs to be used NOW and I'll get to make jam. Today had a whole lot of name-brand stuff, which is a lot unusual. 'Tis the season, I suppose. Usually, there are a lot more dented and dinged items, but at this time of year between corporate donations to Feeding America, and all the food drives, there does tend to be a lot more name-brand stuff in nice cans. This was a great pantry trip. 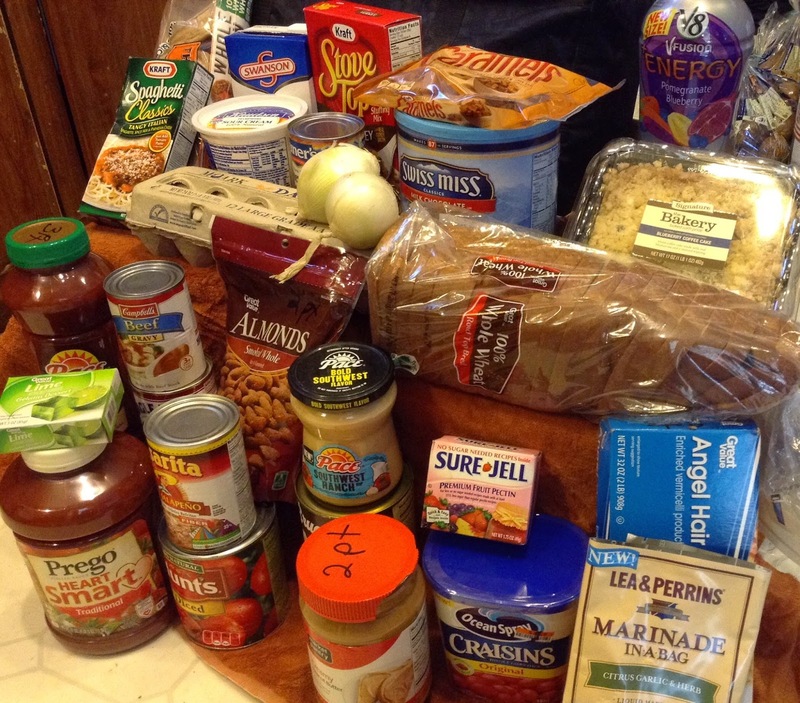 I'm so happy you are getting lots of good food at your pantry! How great to get hot chocolate and other things you don't necessarily buy when on a budget. When I was volunteering in Ohio, one of the things I realized after a few months is when you have a choice of choosing a grain staple like rice (which is affordable) and crackers (which are a luxury purchase) you most often choose the luxury item because you would never spend the money on that type of food. I also noticed that a lot of people did not necessarily 'need' food in that their pantry was bare, but getting food at the pantry allowed them to have money to put gas in their car, pay for heat in the winter, or pay for prescriptions. Which I think many people don't realize. It's great that you volunteer as a family. We always needed extra help at our pantry..and so few of the customers were willing to volunteer. Jennifer -- I know I tend not to choose things like rice and dried beans. Mostly because I end up getting those in 25# or 50# bags when we get our tax refund. Getting food at the pantry does make other choices a bit easier.